The Mysteries of the Marco Polo Maps. Chicago: The University of Chicago Press, 2014. 174 p. $45.00. In The Mysteries of the Marco Polo Maps, Benjamin Olshin maintains the air of mystery that surrounds a peculiar private collection of nine maps and related documents referred to as the Marco Polo maps. The collection was first examined by Leo Bagrow in 1948, which led Olshin to pursue a thorough examination of the maps across the collection as well as in the context of their cartographic contemporaries. Olshin poses a variety of questions about each of the maps and their creators and methodically tracks the unusual details found in the maps. One of the maps originating from the collection and included in the inventory, “Map with Ship,” is presently held in the Library of Congress. Olshin discusses the collection’s provenance from their probable origins and makes the connections until they are finally passed down through Filomeno Emanuele Marciano Rossi to his descendant, the current owner of the maps, Jeffrey Pendergrast. A genealogical chart in the appendices illustrates the Rossi family connections. Olshin’s research appears to have gone to great lengths, even so far as to finding obscure geographic references in papal correspondence. 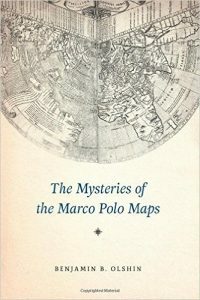 While the potential extent of Marco Polo’s journeys lack documentary evidence, Olshin suggests that Polo either traveled far enough to the east himself or at least to the extent that he met other seafarers who had traversed and charted portions of the Pacific and then shared their information with Polo. While attributing the maps to the Polo family and their contemporaries over a span of a few centuries, Olshin poses the possibility that the maps may have been even later copies because of their inclusion of content which would have been relatively unknown when they were supposedly created and presents arguments both pro and con. Each of the nine maps seems to pose its own set of mysteries. The “Sirdomap Map” contains Arabic script. The “Map with Ship” contains Chinese script and the “Moreta Polo Map I” contains doubtful Chinese lettering. This brings up more questions for the reader. What were the limitations of the mapmakers themselves? What resources did these mapmakers have at hand? Were they aware of Ptolemy’s contributions to world geography? Did geographic toponyms cross from culture to culture with the increase of sea travel and thus appear on obscure little maps such as these? Because Polo’s daughters appear to have authored several of the maps, Olshin also includes a genealogical chart for the Polo family. Early on in the book, Olshin notes that Marco Polo was not the only seagoing traveler in the family. It was the family business. Legend implies that Marco Polo was the adventurous one who simply traveled further than the rest. In fact, Olshin relates that Rustichello da Pisa wrote the first narrative of Marco Polo’s travels while they were imprisoned together in Venice from 1294-1299. Olshin’s discussion of the maps attributed to Marco Polo’s three daughters Fantina, Moreta, and Bellela, brings up additional questions that Olshin might have investigated further (or did and found documentation lacking). How would the information have been conveyed to them and when? How interesting that the daughters’ notes reflect a feminine perspective, perhaps due to an account from their father that would appeal to their femininity, and they, in turn, delivered to a feminine audience. That Marco Polo dictated the account of his journeys might imply he was more of a storyteller than a writer, and the information was once again filtered. Other than there being no surviving materials that Marco Polo may have created by his own hand, the possibility exists that he may never have kept a journal, and for reasons we will never know, leaving us with yet another mystery. For all his investigations, Olshin draws neither clear nor finite conclusions, instead letting his readers make up their own minds, as the answers to the mysteries remain obscured by time and our curiosity is peaked to dig ever further.